This entry was posted on April 4, 2012 by Paul. Celebrate today’s World Health Day by bagging yourself a bargain from our growing store of ergonomic desktop accessories and computer peripherals. The SlideRite is the newest member of our family of writing and document slopes, and features a removable guide rule that allows you to track documents line by line. By helping you to avoid the twists and turns of modern desk-based working life, along with any consequent aches, pains and strains, the SlideRite is your perfect companion on your journey towards a more comfortable, active and productive old age. For the next four weeks we are discounting both models of the SlideRite by 20%. So the large version – wide enough to be able to place two A4 pages side by side (or A3 landscape) but sufficiently compact to not take up too much desk room when placed beside or in front of your monitor – will cost just £47.96 (ex-VAT), or the small version, perfect for placing single A4 portrait documents, a mere £39.96 (ex-VAT). 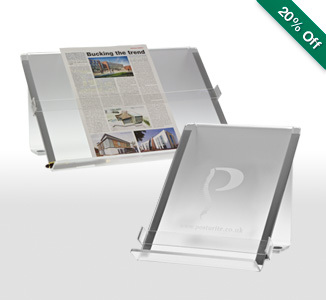 The SlideRite has a fatter lip than most of its older cousins – the original Posturite Board, the top-selling MultiRite, the Writing Angle, the Ergoview and the Freestander – which provides a large, stable base for your documents which are held at a comfortable 50 degree angle. Both versions are available in tough frosted or black acrylic. To take advantage of this special, time-limited offer, visit our website and place your order before midnight on Friday 4 May.